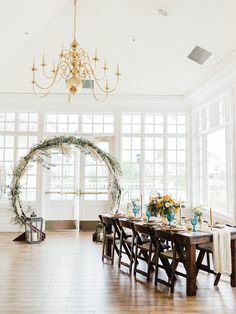 Let’s talk centerpieces! Centerpieces are one of the most important elements in a reception table spread. 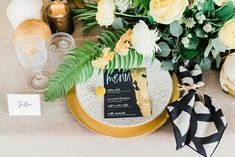 Not only does it need to compliment your own bouquet, but it should tie together the theme and color palette of the day as it’s presented in the center-most part of the tables that all your guests will be seated at. Over the years, centerpieces have gone through an evolution of styles. What once used to be a simple bundle of red roses in the middle of a table has turned into an art form of its own, and we just can’t get enough of it. 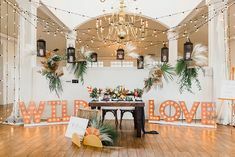 Florists work hard in collaboration with the bride to bring together the most perfect combination of flowers and plants for your centerpiece that will encompass the wedding atmosphere. 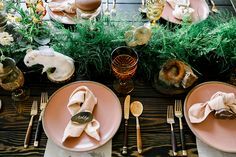 Our spring issue of Exquisite Weddings showcased some of the most beautiful centerpieces that we’ve ever seen, and we had to share them with you. Take a look at some of our favorite centerpieces below! A centerpiece of pastel colored flowers are always a good idea. The sweet and dainty hues combine effortlessly together no matter which colors you choose. This centerpiece by L&S Design is a fabulous creation of blooms spilling over a bowl. “My flowers were one of my very favorite things at our wedding, design-wise,” bride Chelsea said of her fuchsia, blush, and pastel flowers throughout the wedding. Check out Chelsea & Matt’s Carlsbad real wedding here! Here’s a tip! If you’re not quite sure which direction to go in when you’re deciding on a flower combination, it’s simple, just pick what you like! That’s what bride Devon did with this gorgeous centerpiece created by Rae Florae. “It slowly evolved into a look that I loved,” Devon recalled. View more of Devon & John’s Rancho Santa Fe real wedding here. One centerpiece trend that we’ve been seeing everywhere this season is spotlighting your centerpiece with one main, exotic flower, like this one by L&S Design. The protea flower has been a huge hit with it’s interesting and urban look. Basing your centerpiece with strange looking flower gives it a little pop of character and keeps it interesting. Other unusual flowers that have been popular include succulents, dahlias, cactus, and lotus pods. If you want to go bold, go BOLD! If there’s one thing that is more important than the flowers in your centerpiece, it’s what the flowers go in. Spice up your arrangement with a brightly colored vase. This color blocked combination by Isari Flower Studio and Events is a perfect example of what we mean. Use a vase with a bold color or one with a cool, geometric shape, like the ones shown here. Get a closer look at this centerpiece and more at Jamie and Luke’s Valle de Guadalupe real wedding here. It’s called centerpiece for a reason… make those flowers feel special and share some of your spotlight!